Still, even rain in Rome isn't all bad—it definitely makes for pretty photographs! If you’re considering traveling to Rome in the winter, we have good news: We think it’s a great time of year to come! From fewer crowds to lower accommodation prices, there are a lot of perks to coming to Rome from November to March. Here are some tips to know about traveling to Rome in winter! When is the off season in Rome? Mid-November to Easter, excluding Christmas and New Year’s. What to expect in the off season: Crowd-wise, expect it to be much more tranquil than usual! Of course, some areas of the city will always have tourist crowds. Even in the dead of winter, you can expect at least an hour-long line at the Colosseum, and unless you come at 3 a.m., you won’t be alone at the Trevi Fountain for a minute. Still, these crowds are much smaller than they’d normally be. Instead of being shoulder-to-shoulder packed like you would be in the summer, for example, you might actually have some breathing room in the Sistine Chapel. At certain times of day, there might not even be a line into the Vatican museums or St. Peter’s Basilica. And at lesser-known attractions, you just might be the only one in the room! Another perk of Rome in the winter is the lower prices. Hotels, B&Bs and apartments all tend to lower their rates in the off season, as do airlines… so you can save a bit of extra cash. 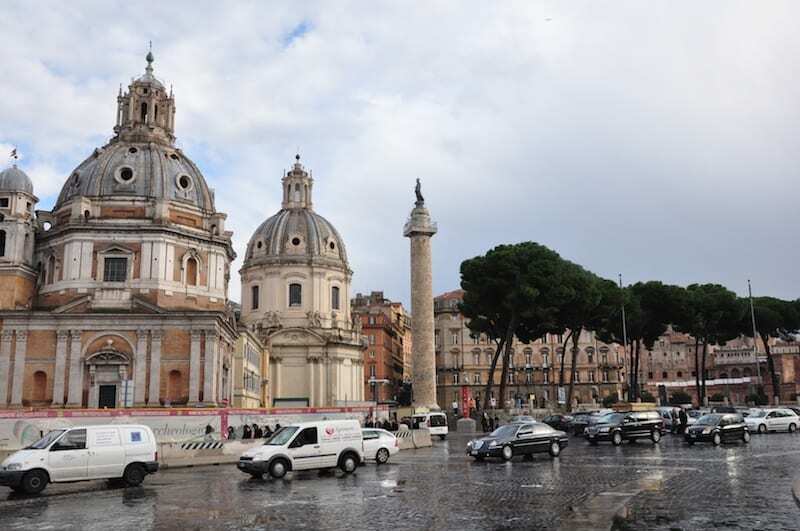 Rome at Christmas comes with perks, including the Piazza Navona Christmas market! The closer it gets to Christmas and New Year’s, meanwhile, the more people are in the city (both tourists on holiday, and locals coming into Rome to do their holiday shopping)… but also the more festive it feels! The Christmas lights in Rome are absolutely spectacular, the shops and streets are bustling, and, of course, there are lots of holiday opportunities to see the Pope. 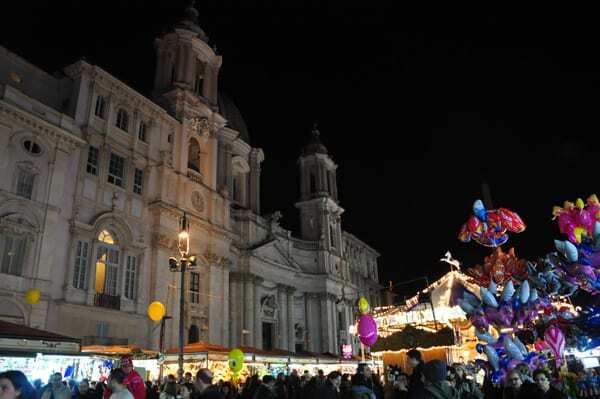 There are also several Christmas markets, including the most famous, at Piazza Navona, which goes until January 6 (the Day of the Epiphany). (Don’t miss our fun video, below, on Christmas traditions in Rome!). Still, even rain in Rome isn’t all bad—it definitely makes for pretty photographs! What you potentially sacrifice for all of those perks, though, is the weather. Although Rome’s climate is generally milder than, say, the northeastern United States, it does get cold, so pack your winter layers and your hats. Snow is also rare here—it snowed once last winter, and was a big deal—so make sure you’re prepared for cold rain instead! That said, depending on your luck, there can be more beautiful, crisp days than there are rainy ones… so keep your fingers crossed. If you come to Rome in the low season: Pack your layers! As in Florence, if you want to “fit in” (or at least not look like a first-time tourist), remember the winter dress code: leather shoes for men and boots for women, wool button-up coats, leather gloves, and, of course, a stylish, warm scarf (for men too!). Next articleSee Painting and Graffiti… in the Colosseum! Love these easy-read city travel guides. Keep them coming please. Last time I visited Rome was right before Christmas (in 2010) and I absolutely adored the festive atmosphere surrounding the city. It did snow a little bit on our first day in Rome. Even though snow should be nothing new to people from the Northern US like me, my travel partner and I felt it was a fairytale-like experience. Gorgeous city – can’t wait to go back! I find that Rome is a wonderful city any time of year, the climate is pretty good for walking and seeing the sights that Rome has to offer. Walking back to your hotel at night with all the Xmas decorations was beautiful and every where. You go had a festive Xmas spirit. One late afternoon we saw orchestra on horseback. Playing Xmas songs in front of the pantheon. Super awesome. what is the best way to get from Rome FCO airport to the Adagio Roma Balduina aparthotel in Roma? Sorry, we’re not sure where your hotel is but there are multiple ways to get into Rome’s city center. You can take a train or bus directly from the airport or you can take a taxi directly to your hotel for around 40 euro. Have a great trip! Hi – thank you for such a great blog full of information, and for the generosity answering all the individual comments and questions. That is super time consuming. Thank you. I was wondering – when do they start lighting the holiday lights? We were planning a tip off season some time in November, and it would be extra special if we also got to see some of the Christmas and holiday lights. Hi Gina, the answer really that it depends. You’ll find some presepe (nativities) and lights up in November, but the bigger displays aren’t really up until closer to Christmas. Sometimes the Vatican nativity and tree aren’t even finished til the week before. Buon Natale!